Support Tree / Events / Getting up in arms about cybersecurity! Will cybersecurity be a pandemic? Computer Security Day is an annual event that brings awareness to a growing and concerning problem – cybercrime. The cost of cybercrime to society is staggering. Industry experts at ConnectWise anticipate that by 2021, the worth of cybercrime will reach 7% of global GDP. That’s over $6 trillion. Of course, measuring the cost to businesses and individuals is a difficult task. The reality is, we will most likely have a cybersecurity pandemic on our hands in the future. One of the underlying issues at the core of security breaches is us, the end user. Human error is the weakest link in the line of cybersecurity defence. We, the end users, are usually the reason for systems becoming infected by ransomware. This can cause files to be wiped or sensitive data like payment information to be accessed without our knowing. It’s not surprising that humans are the weakest links. Most of us weren’t raised with the need to remember and protect more than a handful of passwords. I remember having my telephone banking password in the early ’90s and that was it! Nowadays, I need to pay for a software that helps me to remember the hundreds of passwords that I use for work and at home. At Support Tree, we believe the only way to stand a chance against the ever-growing threat of cybercrime is education. We already educate our clients and contacts through training and events, so we decided to educate the most vulnerable to cybercrime in our society, children. We contacted Broomwood School to see if they would benefit from us visiting and giving some tips on cybersecurity. 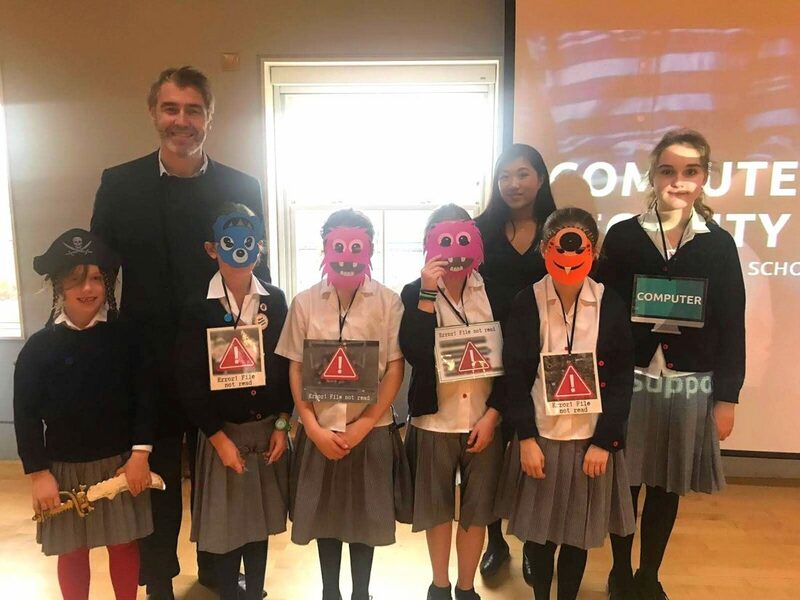 Our idea was warmly received by the Head Mistress, so we started planning our assembly in time for Computer Security Day. Now, I’m the first to admit that cybersecurity is not always the most interesting topic, especially for 8 to 13 year olds. So we certainly had our work cut out to talk about cybersecurity in an exciting and engaging way to the students. We wanted to keep their minds focused for 20 minutes whilst giving them actionable insight and education that made sense. Being something we hadn’t done before, we put our heads down and brainstormed. We chose ransomware as the theme of our school assembly. With the help of some very willing volunteers, we demonstrated how ransomware attacks happen. We started the event by setting the scene by explaining the impact of cybercrime on society and businesses. Then, we asked for some volunteers to help us demonstrate how ransomware attacks happen, aided by a few masks and costumes. It was honestly great to see so much enthusiasm and engagement from the children. As children grow up, they will become more and more exposed to the internet and cybercrime. Therefore, we shared two actionable approaches to help them combat cybercrime. Firstly, we shared the recipe for creating strong and complex passwords, followed by an explanation of two-form authentication. We set a challenge for the students to create a poster on how to best protect against cybercrime. We have 5 great prizes to be awarded for the best entries and we can’t wait to receive all the submissions! I believe that our advice went down very well, and I hope as the children grow up and are more exposed to technology, they will remember the tips we provided, helping in the fight against cyber-crime.